Now, that’s not to say that you can’t build flavor from the ground; oft times that’s the best way to coax flavors from (and for) your soup – as long as what you’re building from helps facilitate a big robust flavor (beans, vegetables, etc.). You gotta have a plan! Truth be told I’m a cheater cheater pumpkin eater; I always use a flavorful broth as my liquid component in savory dishes. I don’t care if I’m making soup, rice, polenta or seitan. I always start with a tasty broth. I’ve both made my own (from scratch) and have used a litany of store-bought broths and bouillon cubes but what doesn’t change is that I use that as my foundation. It’s my secret weapon! So, Yeah. Today I’m making Pozole Blanco (White Pozole) and in this soup – you need a good broth – if you don’t, then you’re doing it wrong. There are essentially three types of pozole: Red (which I’ve made previously), Green (which I will make for the blog soon) and White (which I’m making now yo!). From these three spring a variety of recipes using an assortment of ingredients and procedures. Of these three, the white is the easiest. But is also the most fickle, because if you don’t start with a good broth then you’re back again with no pants on. So, by all means use a broth you enjoy, one that has a deep flavor and one that will stand up (and be tasty) on it’s own. A good broth is all you need here. No need to muddle it up too much (with herbs and whatnot) – you’re looking for a clean flavor that will let the core ingredients shine. 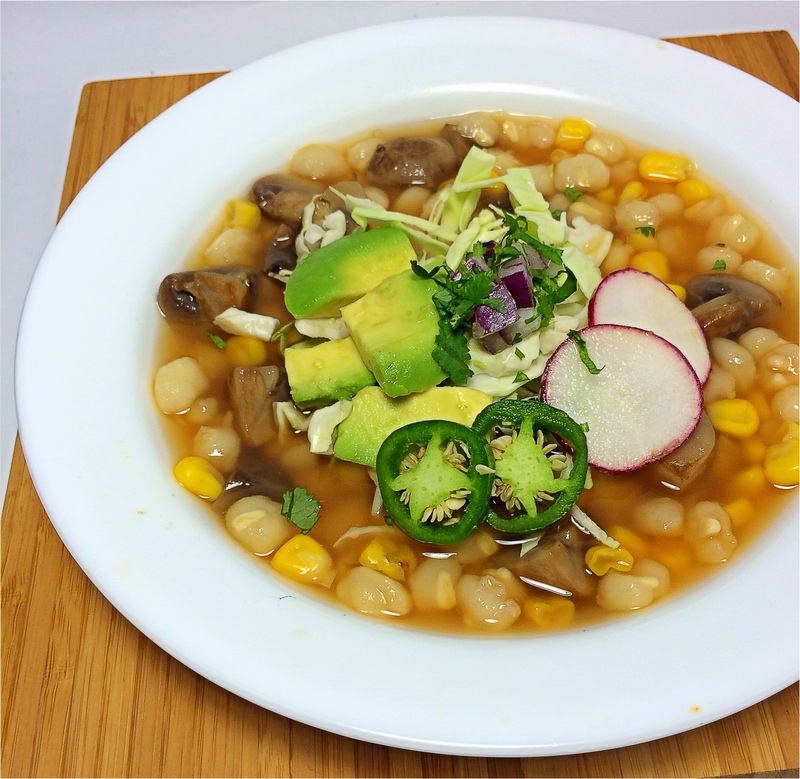 In this recipe I use sauteed mushrooms, corn and (of course) hominy. That forms the core of the soup – the toppings help it bring it all together. 2. Add your quartered mushrooms and saute until all of their liquid has been released and they’ve achieved a nice color (8 -10 minutes) – stirring intermittently. 3. Sprinkl mushrooms with garlic powder and nutritional yeast – stir. 4. Add your soy sauce and water and stir mushrooms. 5. Lower heat to low and cook until all of the residual liquid has evaporated. 6. Heat your broth in a stock pot or large pot over medium heat. 7. Add cooked hominy (if you’re using canned rinse thoroughly), corn and (cooked) mushrooms. 8. Bring to a boil then shut off heat and add your lime juice – stir. 9. Allow your soup to stand at room temperature for 30 minutes – this will help settle the flavors. 9. After 30 minutes bring your soup up back to desired temperature – salt to taste. 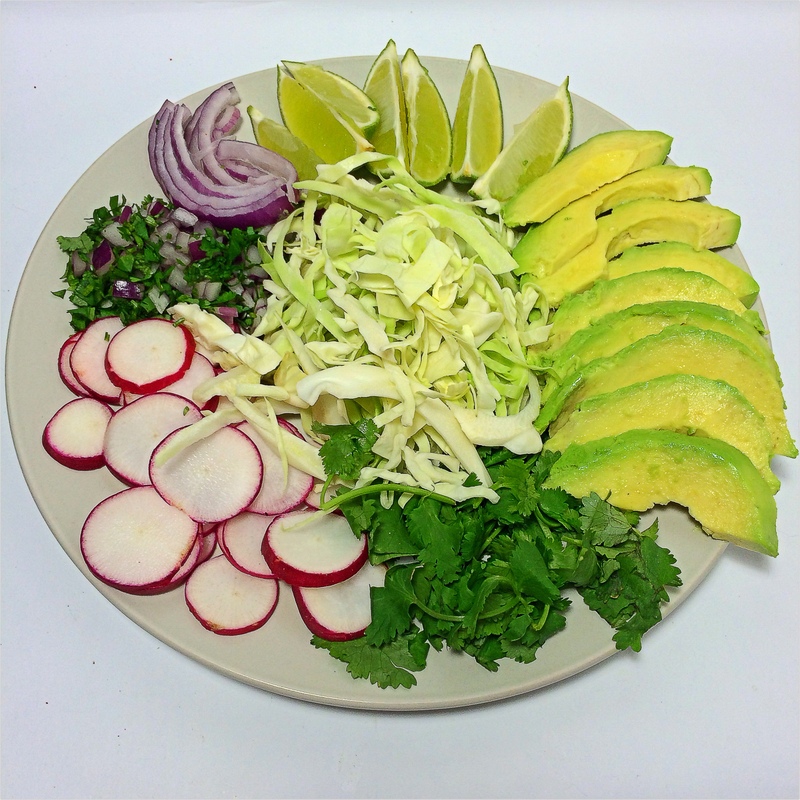 Serve with your favorite toppings such as: Thinly sliced radish, Diced Avocado, Chopped Cilantro, Chopped Onion, Julienne Cabbage, Lime wedges, Hot Sauce, Thinly Sliced Fresh Jalapeno etc.